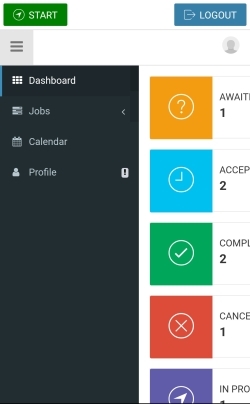 The Driver App allows drivers to connect with the EasyTaxiOffice Dispatch software in an easy and fast way. 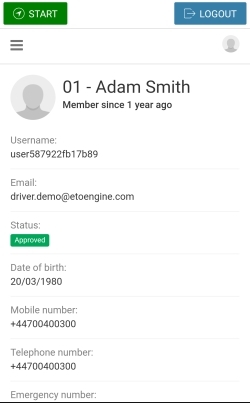 For a driver to start using the Driver App, an admin has to first create an account for drivers and then send them the access details. Click Add New button to add a new driver. Learn how to track a driver, HERE. Note: Admin can also send his driver a direct link to app stores to shorten the journey. 2. Download the app and install it on his phone – this process is very easy and it takes only a minute. Note: We can personalise (white label) your app, filling it with your company’s full branding. Once we do that, your drivers will be able to search for “Your Company Name” app from the app stores. The customised version will have the company logo, name and colors. See our white label setup app requirements HERE. Click HERE for pricing. 3. Login to the account with individual access details provided by admin (email, password) and by following a unique company Host URL. Admin can find Host URL in Settings -> Mobiles Apps section of your dashboard. Working with the DriverApp is easy and very intuitive. It also does not require any technical knowledge. This section consist of five tabs: In progress, Awaiting approval, Accepted, Completed, Canceled – which display all the jobs a driver can complete, must complete and has already completed. In progress – a job that the driver is currently undertaking. Awaiting approval – after receiving a notification about a new assigned job, the driver can accept or reject the job. Before deciding on what to do, the driver can check all the job details. If he accepts the job, it is automatically moved to Accepted tab. Accepted – list of jobs the driver has accepted to do. Completed – list of jobs the driver has completed. All drivers can access the history of all the jobs they have completed. Canceled – list of jobs which have been canceled. 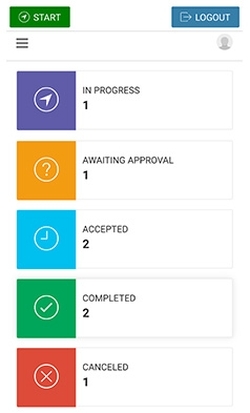 After entering a chosen reservations tab (Awaiting approval, Accepted, Completed, Cancelled) the driver will be able to choose from several actions from the menu above the booking list. Column visibility (eye symbol) – the driver can customize his panel, using this option he can switch on/off columns to create the most suitable setting for his style of work. With a single click a column can be added or taken out of view. The user decides which ones he wants or needs to activate at a given time. Active columns are highlighted with blue and the inactive ones are grey. Refresh (right-left arrow symbol) – if the driver wishes to refresh the system, he can do that at any moment with the third symbol. The driver`s panel does however have an automatic, 15 second refresh mechanism anyway. Search – allows the driver to search specific data via a keyword. This section allows the driver to see the jobs on a traditional calendar. 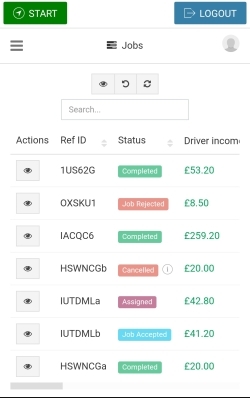 In this section the driver can fill in and edit his details. 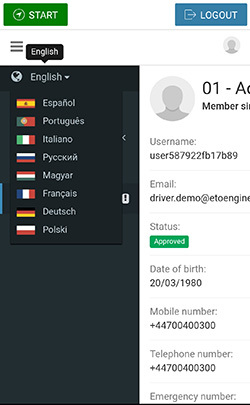 This tab allows the drivers to change the app’s language version to their prefered language. This option is located in the Profile section. Note: For an additional fee, we can translate the Driver App into any spoken language you may wish to use. Please contact us for details HERE. Interested in purchasing the DriverApp? Please check the pricing HERE.